It can sometimes be difficult to stay fit and healthy while on holidays but at Couples Resorts it couldn’t be easier. Our four beautiful resorts have countless exercise options and numerous healthy food choices for you to enjoy. Whether you want to relax or explore, there are activities to suit everyone. In this blog we share some advice for how to stay fit on holiday! Couples Resorts in Jamaica offer a large number of fun fitness classes to their guests. Don’t just be spectator, join in on the fun! These classes are perfect for all fitness levels and abilities. Start the day with a yoga session by the beach which will help you feel revitalised and ready for your day. There are plenty of other fitness classes available throughout the day, including aqua aerobics, pilates and spinning. If classes aren’t for you, personal trainers are available for private sessions in our resort gyms – this is a great way to focus on your own fitness. Situated in Ocho Rios and Negril, Jamaica, Couples Resorts boast some of the most beautiful beaches in the world. A jog or run along the beach is the perfect way to take in the islands stunning views. Listen to the birds as you breath in the morning fresh air. If you prefer cooler conditions, go for an evening run with your partner and take in the wonderful display of tropical colours during sunset. Embrace the amazing facilities that are open to guests. Couples Resorts boast a bright, spacious and air conditioned fitness centre. It is fully equipped with treadmills, weight-training machines and other fitness machines. Chilled water and fluffy towels are provided at the gym to make your visit even more satisfying. Couples Swept Away has a 10 acre sports & fitness complex. This holds a tennis courts, two squash courts, two racquetball courts, a fully equipped gym, a 25-meter lap pool, steam rooms, saunas, jacuzzi, and a basketball court. This state of the art complex is open to all guests with tuition available for anyone new to any sport. Jump in the gigantic pools or explore the warm waters around the islands. Swimming, kayaking, snorkelling and paddle-boarding, are not only great activities for couples, they are also an excellent way to stay fit. If you love the ocean and all the beauty that lives below, grab a snorkel and venture out to the magnificent coral reefs. 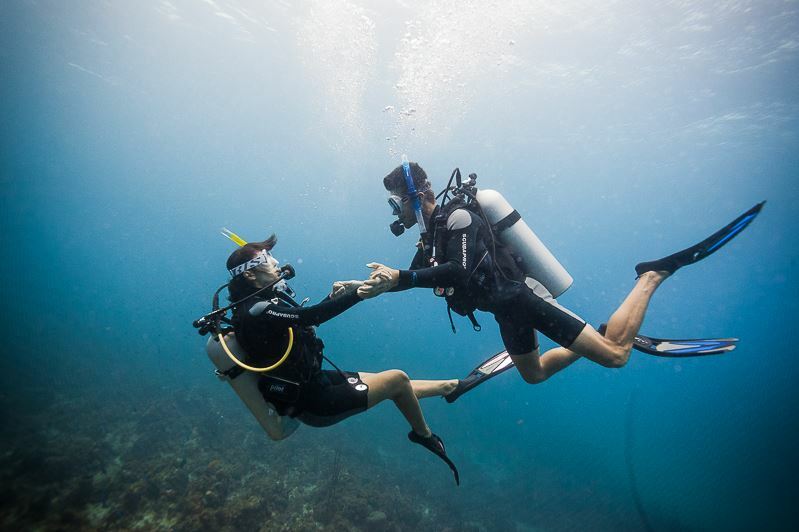 Learn how to scuba dive with professionals by your side. Observe the tropical fish for an experience that is both exciting and fitness-friendly. There truly is no better way to keep fit in paradise. Eating well and staying hydrated is a major part of staying fit, particularly when in warmer weather conditions. At Couples Resorts all guests are provided with complimentary water flasks, so you can make sure you always have fluids at hand. It can be easy to over indulge on your holidays but with countless delicious options going for the healthier choice is easy. From juices and salads bars to five-star dining restaurants, Couples Resorts offer the freshest produce on their menus. Enjoy the fabulous range of tropical fruits, vegetables, seafoods and lean meats used by renowned chefs. Visit the popular Veggie Bar at Couples Negril for clean foods and drinks. Try the fruit smoothies, veggie dips and delectable salads and sandwiches. This healthy food will give your body the nutrients you need to stay fit on holiday. Have you visited Couples Resorts before? Tweet us at @CouplesUK and let us know about your experience!